Guard Sara Ross during a game against the University of Illinois-Springfield last semester. 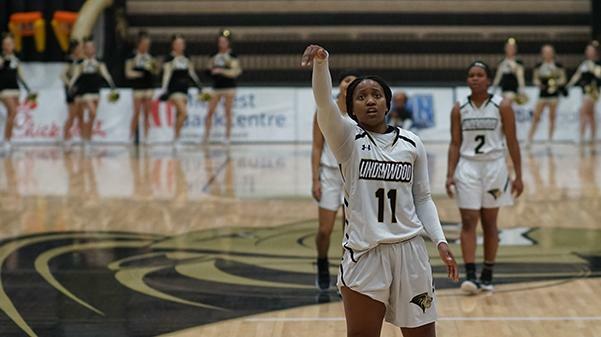 Off the heels of an MIAA-program best regular season, the Lindenwood Lions reached the semi-finals of the conference tournament where they fell to the University of Central Missouri Jennies. Lindenwood went into Kansas City as the third seed after a regular season that saw the team go 20-6 and 14-5 in conference play. The record was a team-best since the Lions joined the MIAA, and earned them a match up with sixth-seeded Pittsburg State on Mar. 8 at Municipal Auditorium. The last time these two sides met was back on Jan. 5, a game the Lions won easily at home by a final score of 81-61. The postseason battle proved to be a much closer and lower-scoring contest, with Lindenwood holding off the Gorillas 54-50 despite a fourth quarter Pittsburg State surge. Pittsburg State struggled mightily from the field in the first half, shooting a combined 29.2% and went 1-10 from three point territory. 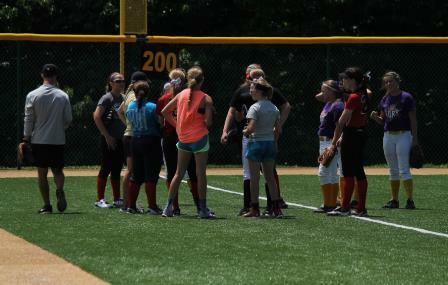 Lindenwood was able to take advantage after a dominant performance early on by Kallie Bildner. Bildner had 11 points and nine rebounds at the break, while Lindsay Medlen posted eight points to lead the Lions to a 29-20 lead at the half. Improving on the offensive end were the Lions in the third quarter. Lindenwood tallied a game-high 19 points in the quarter, with Kylie Ferguson catapulting their attack with five points in the first four minutes of the second half. At the end of three, Lindenwood had a commanding 48-33 lead. While the first three quarters were taken over by the Lions, the fourth was all about the Gorillas. Pittsburgh State went on a 16-3 run to cut Lindenwood’s lead down to just 51-49 with 52 seconds left to go. Slowing the Gorillas’ roll was Medlen, who hit both of her free throws to give the Lions a two-possession lead. Pittsburg State wouldn’t be able to complete their improbable comeback attempt, as Lindenwood won 54-50. Central Missouri was next on deck for Lindenwood in a semi-final match on Mar. 9. In their previous two meetings, the Jennies won by score lines of 74-68 and 76-66. In their third pairing, it would be Central Missouri once again knocking off Lindenwood in their closest contest yet, 67-61. Neither team separated one from the other in the first, as Lindenwood at one point had a 12-8 lead. But after a few scoreless minutes on both sides, Central Missouri would pull ahead thanks to three drained by Morgan Fleming. This gave the Jennies a 13-12 lead at the end of one. Their lead wouldn’t last for long, as Lindenwood’s offense exploded in the second quarter. The 22 points were the most the Lions would score in any quarter this tournament. Lindenwood’s seniors led the way, collecting 20 the team’s 22 in the quarter while holding the Gorillas to 14 points. Grabbing the momentum at the buzzer was Central Missouri, however, as Sydney Crockett hit a three pointer to cut the Lions lead down to 34-27. The number of the game ended up being 22, as that’s how many points the Jennies put up in the third quarter. The Lions led 45-44 with 2:07 left in the quarter, but a 5-0 run to close it out saw the Jennies take a 49-45 lead heading in to the final quarter. With 3:06 left in the fourth quarter, Central Missouri had a 10-point advantage but Lindenwood put together a 7-0 run to make it just a three point game. It came down to free throws for the Jennies, and they were lights-out. Central Missouri went 5-6 from the line to close the game out, winning 67-61 and advancing to the MIAA championship game against Fort Hays State on Sunday. Charisse Williams was the leading force on offense in the losing effort, notching 22 points, a season-high. Bildner averaged 14 points and 15 rebounds per game in the tournament, while Ferguson averaged nine points over the course of both games. Then, Lindenwood fell to Central Missouri again in the NCAA Division II Regional on Mar. 15. This lost left Lindenwood with an overall record of 21-8 for the season, the team’s most wins in its NCAA history.